Yury Filatov said it was “absolutely ridiculous” to suggest Russia was covering up any chemical attack. THE RUSSIAN AMBASSADOR to Ireland has said today that, following Russia’s own military probe into the alleged chemical weapons attack in Syria, “as far as we can see, there was no attack in Syria”. Chemical experts are due to arrive in Douma tomorrow to probe the alleged poison gas attack, but the US has voiced fears Moscow may already have “tampered with” evidence at the site. Following weekend missile strikes on Syria by the US, France and Britain, Russia traded accusations with western nations yesterday and today, dismissing as “a blatant lie” accusations that Moscow was hindering the investigation in Douma. The weekend missile strikes were in response to an alleged chlorine and sarin gas attack in Douma on 7 April in which 40 people were said to have been killed. Speaking today to reporters from the Russian embassy in Dublin, Yury Filatov said that any suggestion that Russia would cover up such an attack was “absolutely ridiculous”. The ambassador said that the western air strikes were an “act of aggression” and “reckless”, and that the Russian military investigation found nothing to back up the claim that Syrian forces had perpetrated a chemical attack. He also suggested that the footage purporting to show people being treated in a hospital in the aftermath of the attack was staged. “In fact I can suggest, we have witnesses from the hospital where the famous video was shot,” he said. “The normal life in the emergency room was going on, people were being treated, then all of a sudden people rushed in and shouted ‘chemical attack’ and starting to pour water. People were in a panic. Two or three other people made footage of the whole commotion that was immediately transferred to YouTube and media networks. Filatov said that it’s “practically impossible” to eliminate traces of the chemicals used in the alleged attack, and warned continued action from western countries risks deteriorating its relations with Russia. In Syria, Chemical experts OPCW director general Ahmet Uzumcu said his nine-strong, all-volunteer team had reached Damascus, but so far “the team has not yet deployed to Douma”. Syrian and Russian officials had warned of “pending security issues to be worked out before any deployment could take place,” Uzumcu said. Igor Kirillov, head of Russia’s radiological, biological and chemical protection unit, told reporters the roads still had to be de-mined and cleared and would be tested by UN security services today. “On Wednesday is when we plan the arrival of the OPCW experts,” he added at a press conference in the Russian embassy in The Hague. The US ambassador to the OPCW, Ken Ward, claimed however the Russians had already visited the site and “may have tampered with it with the intent of thwarting the efforts of the OPCW fact-finding mission”. The Kremlin similarly dismissed the claims. “I can guarantee that Russia has not tampered with the site,” Foreign Minister Sergei Lavrov told the BBC. And the Russian ambassador to the Netherlands, Alexander Shulgin, said it was a “blatant lie” that Moscow was hampering the investigation. Instead he said it was the United States, France and Britain who were “standing in the way” of the investigation by ordering air strikes “in the blink of an eye” before the OPCW team had a chance to do their work. The missiles that US, French and British warships fired on suspected chemical facilities Saturday constituted the biggest Western attack against the regime in the seven-year war to topple Syrian President Bashar al-Assad. The targeted sites were largely empty, and were all said to be facilities for chemical weapons storage or production. British Prime Minister Theresa May and French President Emmanuel Macron faced anger yesterday from their lawmakers for conducting the air strikes with the United States. Despite polls showing scant support for the move, May said it had been her “responsibility as prime minister to make these decisions,” while Macron also defended his move as part of his constitutional powers. France urged OPCW nations to boost the organisation’s work so it can completely dismantle Syria’s “secret” toxic weapons programme. And the United States called for a clear condemnation by the OPCW of “the Syrian government for its reign of chemical terror”. The trio of Western powers that carried out the strikes warned they would repeat the operation if Damascus used chemical weapons again. Regime forces have now entered Douma and declared the entire Eastern Ghouta region around it fully retaken, ending a five-year siege and reclaiming an opposition bastion on the edge of the capital. Even though the OPCW team was not allowed in, the Syrian authorities organised a tour of the town for the foreign press, including AFP. It included a visit to the main hospital to which the victims of the alleged chemical attack were taken. Medical student Marwan Jaber said no chemical weapons were used on 7 April. “Suffocation cases arrived as a result of the debris, dust, fire and smoke. They were given routine treatment”, he told AFP. But “strangers entered as we were in a state of chaos and spread a rumour among people there had been a chemical attack, and people became alarmed”. Damascus and Moscow have vehemently denied that any chemical weapons were used in Douma and alleged instead that grim videos showing civilians foaming at the mouth after the attack were staged. 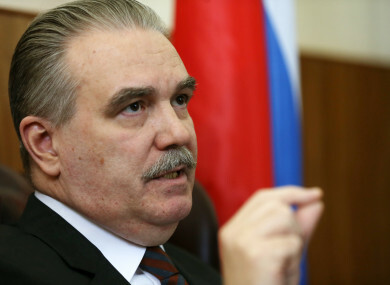 Russian ambassador Shulgin repeated the accusations telling reporters in The Hague that Douma residents had not been able to produce “a single body”. Email “Russian ambassador to Ireland: 'As far as we can see, there was no attack in Syria'”. Feedback on “Russian ambassador to Ireland: 'As far as we can see, there was no attack in Syria'”.